Two pre-recession developments in the Coachella Valley were re-introduced in 2016, each with one key change: Designers had removed planned golf courses, but preserved open space. Virada, a master-planned community in Indio with about 1,300 homes, was previously proposed as a tract with a 27-hole golf course. The updated proposal, from Palm Desert-based Family Development, arranges neighborhoods along a public park instead. Miralon in Palm Springs is a 1,150-home development from Boston-based Freehold Communities. It replaces a pre-recession project called Avalon, where builders actually installed an 18-hole golf course a decade ago. The course never opened, and a decade of desert winds destroyed it. Miralon’s developers plan to plant olive groves on the former fairways. After all, developers and planners said, that’s what buyers liked most about living on golf courses — the open space, not necessarily the game itself. A rendering for the clubhouse at Miralon, which will serve as a hub for the neighborhood of 1,100 homes. Many of the desert’s approximately 120 golf courses were built as real estate amenities first and courses second, National Golf Foundation chief business officer Greg Nathan said. Buyers would pay premiums for homes with fairway views, even if they didn’t golf. Normally, designing open space is an expensive choice for developers — it’s land that could be used for homes, after all — but golf courses also generated revenue. Today, however, courses are no longer surefire investments. Andy Vossler, president and CEO of Landmark Golf, estimated that a new 18-hole course would cost at least $6 million to build, not counting hundreds of thousands of dollars in annual maintenance costs. Further, many courses have faced shrinking memberships and declining revenues since the Great Recession began. Vossler estimated that 33 percent to 50 percent of residents in most golf course communities actually have memberships in their clubs. Ed McMahon, senior resident fellow at the Urban Land Insitute, a think tank focused on land use and planning, offered a slightly lower estimate — 20 percent to 40 percent. He too believes many of those buyers purchased golf course homes because they wanted to live near protected open space. And he believes buyers are still willing to pay a premium for those lots, even if their windows overlook parks or orchards instead of tee boxes. The entrance to Freehold Communities’ Miralon development, where construction is expected to begin in mid-2017. Today, McMahon said, developers are exploring what that open space can look like. Many are designing parks with networks of walking trails. Others are building what McMahon called ‘agri-hoods’ — housing around agricultural land. 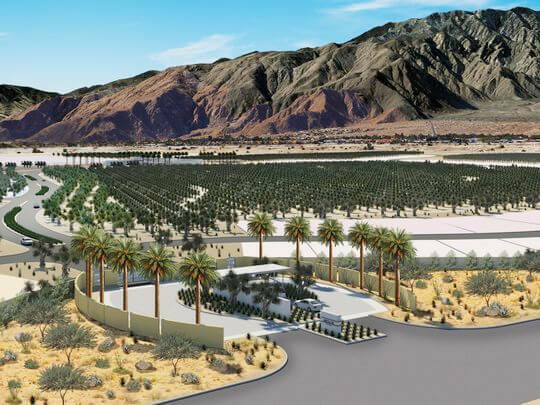 The forthcoming Miralon project in Palm Springs will surround cultivated olive groves, and though developers said it won’t function as a commercial farm, the homeowners association may produce olive oil for residents. Vincent J. Barbato, principal at Family Development, said he and his colleagues made a “pretty immediate” decision to remove the planned golf course at Virada after they acquired the development. He doubted officials would have approved construction of a golf course, and if they had, it would’ve been an unpopular proposal mid-drought. Further, Barbato said, to make a course substantially different or better from the desert’s dozens of others would have been exorbitantly expensive. Shuckhart said builders are currently repairing Miralon’s infrastructure, but hope to offer Miralon lots for sale in the next few months and homes by the end of the year. Barbato said Virada’s homes will not be available this year.